Toronto Film Society presented No Time for Love (1943) on Monday, February 11, 2019 in a double bill with The Devil and Miss Jones as part of the Season 71 Monday Evening Film Buff Series, Programme 5. Production Company: Paramount Pictures. Producers: Fred Kohlmar, Mitchell Leisen. Director: Mitchell Leisen. Screenplay: Claude Binyon, story by Robert Lees, Frederic I. Rinaldo, adapted by Warren Duff. Cinematography: Charles Lang. Film Editor: Alma Macrorie. Art Directors: Hans Dreier, Robert Usher. Set Direction: Sam Comer. Costume Design: Edith Head. Music: Victor Young. Release Date: January 1943. Cast: Claudette Colbert (Katherine Grant), Fred MacMurray (Jim Ryan), Ilka Chase (Hoppy Grant), Richard Haydn (Rger Winant), Paul McGrath (Henry Fulton), June Havoc (Darlene), Marjorie Gateson (Sophie), Rod Cameron (Taylor), Alan Hale Jr. (Union Checker), Grant Withers (Pete Hanagan). Interestingly, Fred would don a superhero outfit complete with cape in a fantasy sequence of the 1943 film No Time for Love. This should be fun to see. Enjoy. 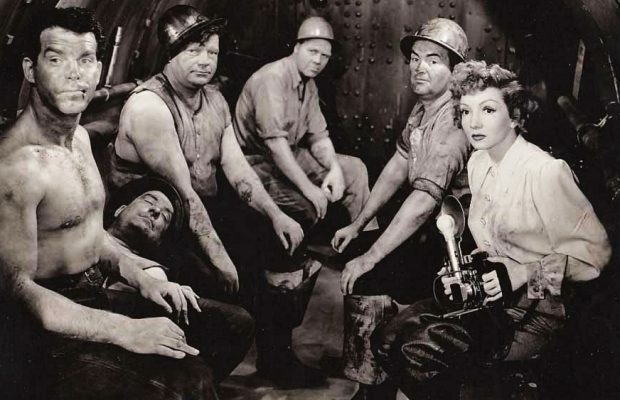 The storyline of No Time for Love is based on a magazine called The Mirror, whose top photographer, Katherine Grant (Claudette Colbert), is assigned to photograph the Interborough Vehicular River Tunnel Project in New York City. Wearing a hardhat and boots, she is taken underground to the construction site, where she is not greeted warmly by the superstitious tunnel workers, called “sandhogs”, who believe that women in the tunnel bring bad luck. When she sneaks closer to the drilling point to get a better view, her presence distracts some of the workers and causes an accident that nearly kills Jim Ryan (Fred MacMurray), the cocky, well-built sandhog they call “Superman”. When she sees the unconscious Ryan about to be crushed by a machine, she drags him to safety. While recovering in a compression chamber, Ryan gets into a fist fight with his fellow sandhogs, who were being photographed by Grant. These photographs were later published and shown, which cost Ryan his job.Grant, feeling guilty, offers Ryan a job as her assistant to offset his lost wages. She thinks that if she spends time with him, she will prove to herself that he is not worthy of her. They go on several assignments together, and despite his flirtations with various cheap blondes, Katherine eventually falls in love with Ryan, who returns her feelings. One night, after sharing a passionate kiss, they are spotted by Hoppy, who reveals Katherine’s original plan to get him off her mind. Feeling that he’s been used, Ryan walks away, disgusted. Ryan and Grant find themselves in a series of events throughout the film that eventually lead to the ensuing love story, and in the end, the two find themselves in the happy position of deciding it is love that they have for one another and both proudly walk off to get married. It was a great ending that the audience enjoyed. As with most films, there were interesting aspects concerning the film from pre- to post-production. Oscar Levant was originally cast for the role of Roger, but when filming was delayed, he was forced to withdraw due to other commitments. Rita Hayworth was originally cast as Katherine, but also had to withdraw, when production was delayed by eighteen months. Claudette Colbert and Fred MacMurray were finally cast in the lead roles. 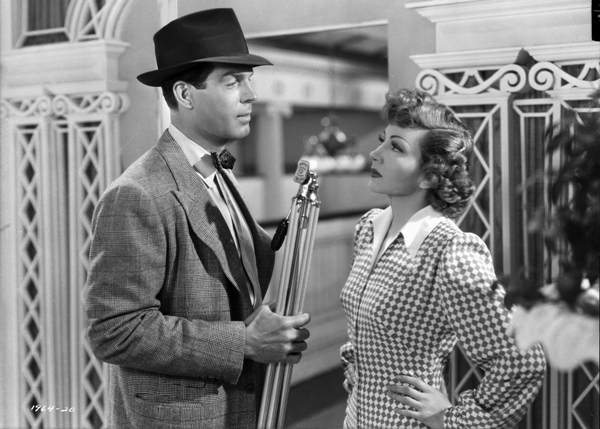 As it happened, they were no strangers to one another: No Time for Love was their fourth film together; they would end up having co-starred in seven films between 1935 and 1948. Both actors had worked with director Mitchell Leisen on a number of other films—MacMurray made a total of nine films with Leisen and Colbert, four. Clearly, this trio liked working as a team. The film was shot at Paramount Studios. A 25-foot-long tunnel set was constructed on Paramount’s largest stage and was filled with mud for the climactic scene. To avoid using real mud, set designers experimented with several combinations of material, eventually using adobe and water. A cement mixer was installed on the set to produce the correct consistency. The director later recalled, “I never asked the actors to do anything I wouldn’t do, so on our first day in the tunnel, I dove right into the mud, head first. I came up and said, ‘All right, let’s go’.” After Colbert’s first take in the mud, she emerged without any mud on her face. “I said, ‘Come here, honey’, and took a handful of the mud and slapped it on her face. She went right back in and did it again.” As it was filmed during the war years, austerity measures limited the amount of money producers could spend on construction materials. To stay within budget, Leisen leveraged one of the sets from Colbert’s previous film, The Palm Beach Story (1942), which was still standing at Paramount, and transformed it into Colbert’s bedroom in No Time for Love.